© 1952 by Fred Rose Music, Inc. Performed by Bob Dylan at a guest performance with Rick Danko/Levon Helm; Lone Star Cafe; NYC, NY, 16 Feb 1983). 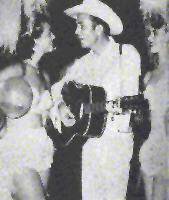 Original recording: Hank Williams, Fall 1952 (demo acetate), Castle Studio, Nashville, TN, Sep 23, 1952 (same recording session as "Kaw-Liga", also covered by Dylan). Hank and I became engaged in Nashville, Tennessee.... This was early summer, 1952.... Hank started telling me about his problems with his ex-wife, Audrey. He said that one day her "Cheatin' Heart" would pay. Then he said, "Hey, that'd make a good song! Get out my tablet, Baby; me and you are gonna write us a song!" Letter to Dorothy Horstman, Jun 3, 1974, reprinted in Sing Your Heart Out, Country Boy, New York, 1976, pp. 219-220.